The Paleozoic Era (540 to 252 million years ago) was a revolutionary time for new life on Earth. But it had its ups and downs. Bony fish diversified during the Cambrian explosion. Just to end in the largest extinction in Earth’s history (Permian-Triassic Extinction). Rainforests flourished from coasts to land. 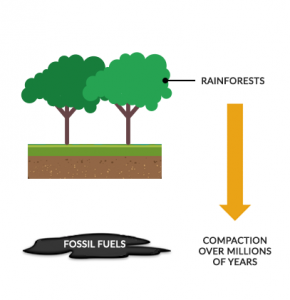 Just to end up being buried, compacted and cooked as coal deposits in the Carboniferous Rainforest Collapse. Finally, amphibians took their first breath of fresh air and colonized an empty continent. Just to end up in a dry desert when rainforests collapsed. Despite the tough times, life on Earth learned to adapt. So let’s review the vitally important chunk of time known as the Paleozoic Era. 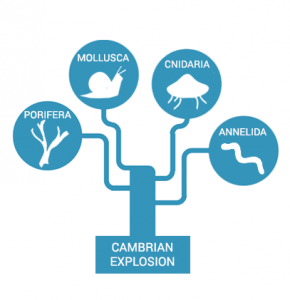 The Cambrian explosion was the largest diversification of life in Earth’s history. New life started in the ocean then moved to land. Everything before this era was Precambrian. We couldn’t identify life because we didn’t have fossilized shells and animals. The Paleozoic Era marked a huge shift when hard-shelled invertebrates (without a spine) began to evolve. From there, life got more diverse in the oceans in the age of fish. Eventually, life evolved on land in the age of amphibians. The Cambrian explosion lasted for about 20 or 25 million years. This period marked the most important evolutionary event in Earth’s history. During the age of invertebrates, trilobites are often considered the first large organism to evolve on Earth. They were hard-shelled organisms belonging to the group of arthropods. We know trilobites dominated at this time because there’s an abundance of fossilized exoskeletons. They are often considered one of the most important early animals for fossils. Next came the age of fish when thousands of fish species evolved. These fish had spines, jaws and mouths which humans share with these vertebrate ancestors. Early sharks and lobe-finned fish swam in the oceans at this time. These fish were ancestors to amphibians who made their appearance at this time. From the ocean to the land, the first vertebrate land animal made its leap ashore. Amphibians took a breath of fresh air and colonized the empty continent of Gondwana. This marked the start of the age of amphibians. Amphibians had a natural advantage because they had minimal competition for food sources on the empty continent. In the Paleozoic Era, the first land plants spread away from the coasts. Eventually, lush rainforests towered over ten meters in height. What’s believed to be an abrupt shift in global warming caused a major marine and terrestrial extinction event. This event was the Carboniferous Rainforest Collapse. Plants and swamps were buried, compacted and cooked into underground coal deposits. To this day, we extract coal from the ground and power electricity generation. Before the Paleozoic Era, there was no coal, oil or natural gas in Precambrian rocks. These rocks stored most iron ore (hematite). But the Paleozoic Era marked a time when coal deposits were buried underground. It left behind vast deserts and islands of rainforests. This was tough for amphibians because they lay their eggs in water. Because of these dryer conditions, reptiles were better suited in the presence of an arid climate. The Paleozoic Era ended with the largest extinction in Earth’s history. Suddenly, the largest evolution of life from the Cambrian explosion became the largest mass extinction. The Permian-Triassic Extinction vanquished 96% of all marine species. About 70% of terrestrial vertebrate species were wiped out. Some believe it was a major asteroid impact event. After the impact, volcanism increased releasing methane into the atmosphere. An alternative Permian-Triassic Extinction cause was that there was a change in sea levels. This caused a reduction in oxygen in the oceans which prevented growth for plant and animal life. Opinions vary about the Permian-Triassic Extinction cause. Since it occurred 252 million years ago, much of the evidence no longer exists or is buried beneath the surface. The Paleozoic Era was historic because it was the first appearance of animal life and fossil record. Consequently, the Paleozoic Era ended with the largest extinction in Earth’s history. 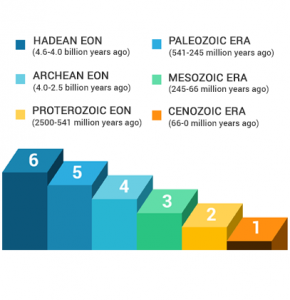 Invertebrates, fish and amphibians evolved in the Paleozoic Eon. But reptiles and dinosaurs become the dominant life in the Mesozoic Era.